South Korea and Malaysia may provide further evidence this week that emerging-market central banks have successfully vanquished the currency crises of 2018, with policy makers in both countries forecast to hold interest rates steady. Turkey, Indonesia and South Africa all kept rates on hold last week, underscoring how tighter monetary policy in many developing economies is keeping the lid on inflation, part of a mix that’s helping to fuel stocks, bonds and currencies. Despite gains that drove the MSCI’s stocks index to its longest stretch of weekly gains in a year, the trade war risks haven’t disappeared, as a string of Chinese data releases on Monday showed the impact of the trade dispute. The Bank of Korea, which last boosted borrowing costs in November, is forecast to keep its seven-day repo rate at 1.75% on Thursday. The bank is also due to release its quarterly economic outlook. A downgrade to the outlook shouldn’t come as a surprise, as the GDP growth estimate of 2.7% for 2019 looks to be far off given the global slowdown in the tech sector, according to ING Groep. Bank Negara Malaysia is expected to hold its overnight policy rate at 3.25%; the bank’s most recent move was a year ago, when it raised the rate by 25 basis points. Nigeria’s Monetary Policy Committee meets Tuesday, with analysts expecting it to hold the main rate at 14%. Investors will see whether Governor Godwin Emefiele responds to criticism from Atiku Abubakar, the leading opposition candidate in next month’s elections. Abubakar said in a Bloomberg interview that he’d replace Emefiele if he wins and that the naira should be floated. Angola is scheduled to announce an interest-rate decision on Friday. China had its slowest expansion since the 2009 financial crisis last quarter amid a debt cleanup and trade woes. Gross domestic product rose 6.4% in the fourth quarter from a year earlier, compared with 6.5% in the previous three-month period. In December, gauges of consumption and factory output accelerated, while investment held up. Brazilian President Jair Bolsonaro, in Davos with Economy Minister Paulo Guedes, will consider proposals for a pension overhaul that all include a minimum retirement age. The nation’s benchmark stock gauge rallied to an all-time high this year on optimism about the overhaul. Some money managers see a bigger rally in store if the measures pass in Congress. Mexico’s statistics agency will post its first inflation data since a fuel shortage rocked most of the nation’s central states. The peso has led global gains over the past month as Andres Manuel Lopez Obrador recovered from a rocky start to his presidency. Venezuela’s opposition is organising nationwide protests Wednesday against President Nicolas Maduro, who they say is holding power illegally after winning a vote last year that many called a charade. The nation’s bonds rallied by a world-leading 19% this year on prospects for a change in regime. Argentina will probably post another trade surplus in December after imports plunged following the peso’s sell-off. Trade is helping the nation close its current-account deficit. Poland will publish December retail sales data on Tuesday, followed by money supply and unemployment on Wednesday and Thursday. The government will hold its second and last regular bond auction on Friday, with supply flagged at 5 billion to 8 billion zloty. South Africa announces December inflation figures on January 23. 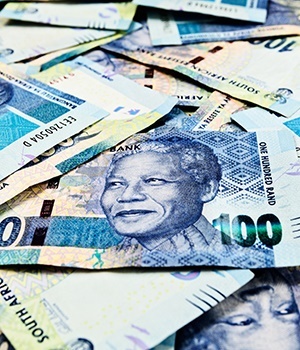 Analysts surveyed by Bloomberg expect the year-on-year rate to have dropped to 4.5% from 5.2% a month earlier, which may further buoy the rand, one of the world’s best-performing currencies this year.